How do you write about the unspeakable? And how do you prevent it from slipping away into the darkness of amnesia and selective remembrance? 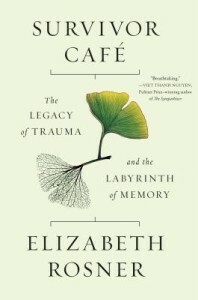 In Survivor Café (Counterpoint, $26), Elizabeth Rosner emphasizes the importance of asking such questions. The daughter of Holocaust survivors, Rosner early on in the book discusses her trip back to Buchenwald with her father, and their attendance at a “survivor café,” an event where survivors, family members and sometimes locals gather together to share stories of their experiences. From there, Rosner wends her way through stories and sources pulled from recent human rights tragedies. Though they are often difficult to read, each testimony is bound to the others by the way personal and generational memory is distorted, suppressed, and passed down. The book addresses an often under-discussed aspect of trauma—its effects on later generations. Rosner writes of Marianne Hirsch’s term “post memory”—a phenomenon that implies inheritance can exist among family members as well as in whole societies—as well as recent research which reveals that trauma can literally change one’s genetic makeup. Despite the pain inherent in this realization, Rosner argues that the greatest danger lies in forgetting the stories entirely. Survivor Café disrupts the narrative of forgetting, insisting on placing human faces, names, and stories onto skeletal and often incomprehensible facts. Stunning realizations slowly unwind the boundaries between traumatic events, intimately humanizing them. Rosner speaks to a woman whose father was a fighter pilot in World War II, who tells her, “My father may have dropped bombs on your father.” When a Holocaust survivor tells her story, Rosner is moved to tears by its similarities to her own mother’s life, a tale she was never able to discuss fully before her mother’s death. Eden Arielle Gordon is a junior at Barnard College majoring in English with a concentration in creative writing, and she is a former Lilith intern.